Recent developments in gas chromatography-triple quadrupole mass spectrometry (GC-MS/MS) technologies have allowed their use for confirmatory analysis and control of maximum levels (MLs) and action levels (ALs) of polychlorinated dibenzo-p-dioxins (PCDDs), polychlorinated dibenzop-furans (PCDFs), and dioxin-like polychlorinated biphenyls (dl-PCBs) in certain food and feed samples, according to current EU regulations 644/2017 and 771/2017. Gas chromatography – high-resolution mass spectrometry (GC-HRMS) employs high mass resolution to provide the high selectivity required for the separation of toxic congeners from any interfering matrix components. By contrast, triple quadrupole tandem mass spectrometry (GC-MS/MS) utilizes highly selective, compound-dependent precursor-to-product transitions to obtain total ion chromatograms (TICs) with little or no interference from nonrelated matrix components. Advanced Electron Ionization (AEI) source was evaluated for the analysis of PCDD/Fs in solvent standards and real food/feedstuff samples. Suitably set LOQs were employed to show compliance to one-fifth maximum levels and demonstrate the sensitivity, selectivity, and robustness required to operate in a routine environment. The TraceGOLD TG-Dioxin column provided excellent separation for TCDD/F and PeCDD/F congeners and chromatographic resolution compliant with current EU regulations. 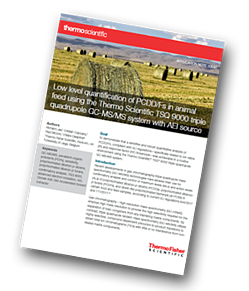 The results of this study demonstrate that the TSQ 9000 GC-MS/MS system configured with the AEI source satisfies all of the current EU commission requirements for the detection and confirmation of dioxins in food and feed samples.